A TESOL certificate is one of the quickest and easiest ways to start a career teaching English as a Second Language or English as a Foreign Language. But with so many TESOL certificate programs to choose from, how do you choose the best one? What type of certification is right for you? TESOL, TEFL, TESL, or CELTA? On-site or online? Visit my Finding the Best TESOL Certificate page for tips on finding the right program for you and characteristics of the best TESOL certificate programs. Sally in the U.S. wrote this question about a Christian-based ESL curriculum. Unfortunately, she didn't give me an email address to answer her. Hopefully, she'll come back for the answer. "I will be teaching ESL to Spanish speakers through my church. I'm excited, but nervous. I've never taught ESL. I taught HS 20 years ago -- Media and English degrees. help anyone wants to offer. We don't have a curriculum or supplies. We have thought it would be good to be able to use a biblical, Christian based, curriculum. I haven't been able to find one. Any thoughts?" That's great news, and you're right, teaching ESL is exciting. It seems that churches and other non-profit organizations are great places for non-English speakers to get low-cost or free English classes. And it also seems that these organizations are often expected to provide services with limited or no resources! That's a shame. What and how you teach will depend upon (1) the English level of the students, (2) their age, and (3) their purpose in learning English. You didn't mention the specifics of the first two items, but there are tons of free resources online to address the first two issues. It just takes time to find them. However, I want to address the third issue in more detail. 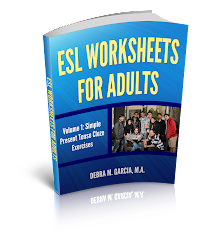 One thing that ESL/EFL teachers, especially teachers of adults, need to ask themselves is WHY are these students taking this English class. In your case, Sally, is it to get a deeper understanding of the Bible or of their Christian beliefs? Or is it so that they can get a job or make advancements on their current jobs? Is it so that they can take care of the day-to-day tasks of living in an English-speaking country? Is it so that they can feel better about themselves and have more confidence in their English speaking abilities? Is it to gain "survival skills?" Etc. The teacher has to put the students' needs first. While it's fine to approach a class from a particular orientation, in this case a Christian orientation, the lessons should be something that the students can use in the "real world," in their day-to-day lives. The material and topics covered should be transferable to the students' lives outside of the church. I don't know of any Christian-based curriculum, Sally. You may be the person to create such a curriculum. I would just suggest that you find a way for students to transfer the English skills that they learn with you into their day-to-day lives. Yep. Some unscrupulous person has stolen all the content from this ESL blog and posted as his or her own. Amazing. You can see the thief's blog at http://www.teaching-esl-to-adults.blogspot.com. I guess he or she is a little behind, though. The last post the thief has as of today is only through February 1, 2009. 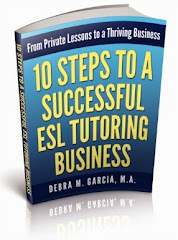 I've been writing this ESL blog since March 2007. For the first year, I wrote a post every day. It's a little disheartening to see that someone has stolen all of my work. But life goes on. I've mentioned before how I advertise on craigslist.org and that I often get responses from scammers, people trying to steal money from other people. Now here's one more way for people to be dishonest. With the internet there are just so many ways for unscrupulous people to behave. But there is a lot of good that can come from it, too. So I'll focus on that. I suppose this world economic situation has people doing things that perhaps they would not normally do.